We utilize a strict chain of custody and tracking procedure that includes the use of numbered stainless steel ID tags. Your pet’s stainless steel ID tag will stay with them throughout the cremation process (including in the crematorium). After cremation, if needed the tag will be cleaned (so that you can read the number) and included in the bag holding your pet’s cremated remains. The fact that we invest in uniquely numbered stainless steel ID tags sets us apart from our competition. Some cremation services don’t use tags at all. Others use inexpensive aluminum tags that would melt in the crematorium so the tag is removed from the pet prior to cremation. Using stainless steel ID tags is the only way to guarantee the return of your pet’s cremated remains. Once a pet is cremated, it is impossible to tell who is who. Unless there is a stainless steel ID tag in the cremated remains to confirm the identity, then there is room for human error. 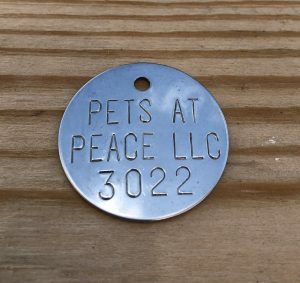 Using steel ID tags and a strict chain of custody allows Pets at Peace LLC to guarantee, with 100% surety, the return of your pet’s cremated remains.